Although new technologies appear poised to alter it, the library remains a powerful site for discovery, and its form is still determined by the geometry of the book and the architectural spaces devised to store and display it. American Libraries provides a history and panorama of these much-loved structures, inside and out, encompassing the small personal collection, the vast university library, and everything in between. Through 500 photographs and plans selected from the encyclopedic collections of the Library of Congress, Kenneth Breisch traces the development of libraries in the United States, from roots in such iconic examples as the British Library and Paris’s Bibliotheque-Ste.-Genevieve to institutions imbued with their own American mythology. 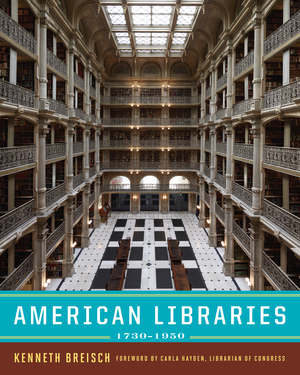 Starting with the private collections of wealthy merchants and landowners during the eighteenth century, the book looks at the Library of Congress, large and small public libraries, and the Carnegie libraries, and it ends with a glimpse of modern masterworks.